The rapid pace of device development and complexity in applications along with a lack of concise, problem-oriented references has made it difficult for non-electrophysiologists to confidently manage patients with implanted cardiac rhythm devices (ICRDs). 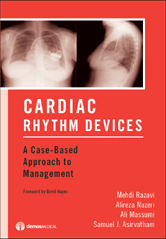 Cardiac Rhythm Devices: A Case-Based Approach to Management provides a practical, problem-oriented, and case-based guide to assist in troubleshooting and management of the common complications of ICRDs. Readers will gain fundamental understanding of the applications and clinical indications, procedural techniques, pre- and post-procedure management, and common complications and their management. Nearly fifty in-depth case presentations provide real-world examples of issues associated with IRCDs and the many factors involved in clinical decision-making and effective management. The cases can be studied individually and in any order. Also included are handy indexes of "key points" that make it easy to quickly locate cases and discussions of any specific topic. This practical book is an indispensable resource and quick reference for the clinical cardiologist, cardiology fellow or any practitioner needing to improve understanding and skills in the application of IRCDs.